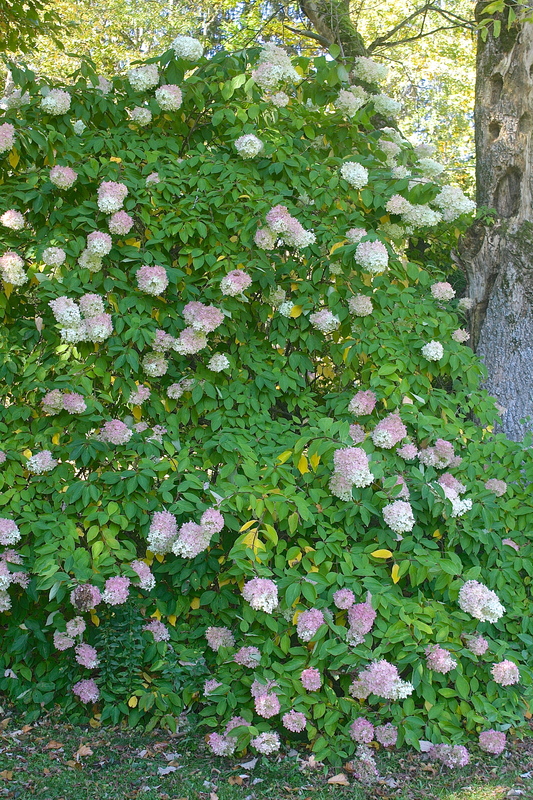 My friend Carol has a PeeGee Hydrangea (H. paniculata) in front of her house, which has been burnished a lovely shade of deep rose and mauve from the cool weather, but not yet ruined by frost. I suggested we get together to make wreaths out of some of her blooms and she enthusiastically agreed. We lucked out weather-wise as the day dawned bright and clear. We set up a folding table outside to take advantage of the beautiful day and with no worries about making a mess. There are always a few spiders and creepy crawlers in freshly picked flowers, so they got a chance to make their getaway safely. We chose the rosiest blooms we could find, filling a laundry basket with voluptuous, heavy bracts. 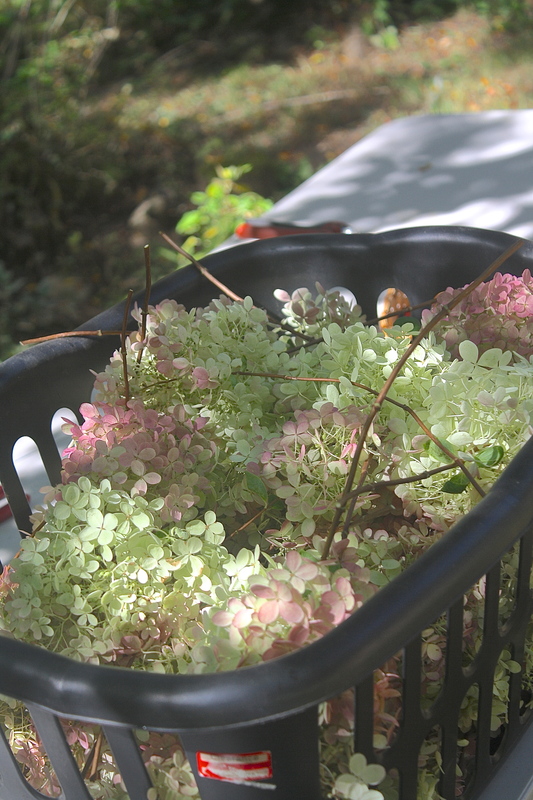 Working with fresh hydrangea is much easier than dried; while it is equally delicate, it is more pliable than brittle. I had a store-bought wreath frame on hand, but a coat hanger works as well. The hook is bent around as a nail hanger and all the angles worked into a round shape. 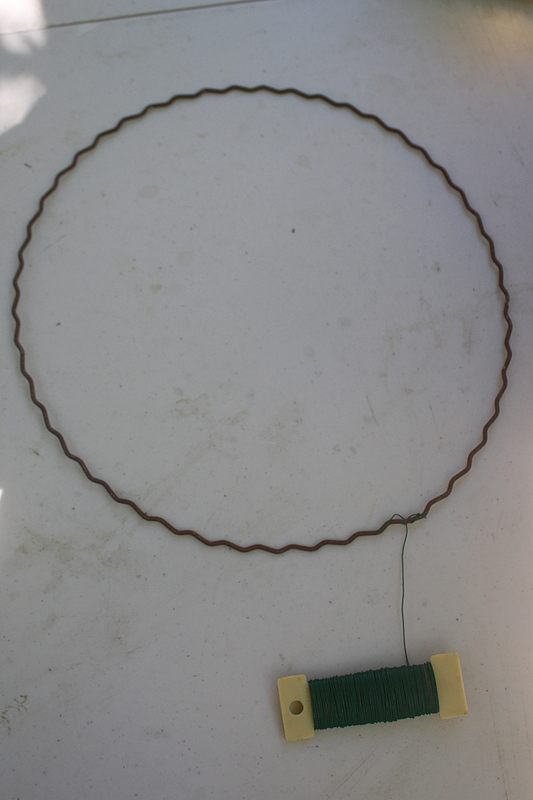 Using a spool of 24-gauge wire, we begin by securing the wire to the frame. 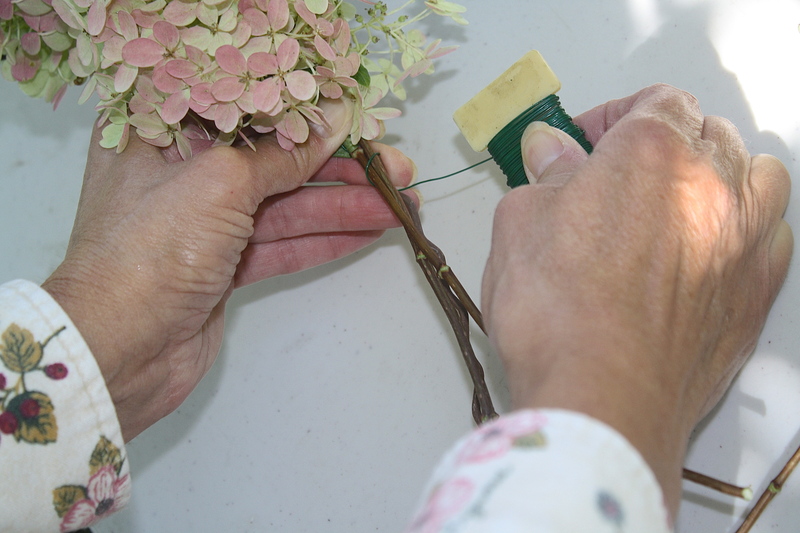 Choosing one or more blooms, placed along frame, we wrap gently, but firmly (too tightly, the stems will break; too loosely, they will fall out as the stems dry), attaching it to the frame with several loops. 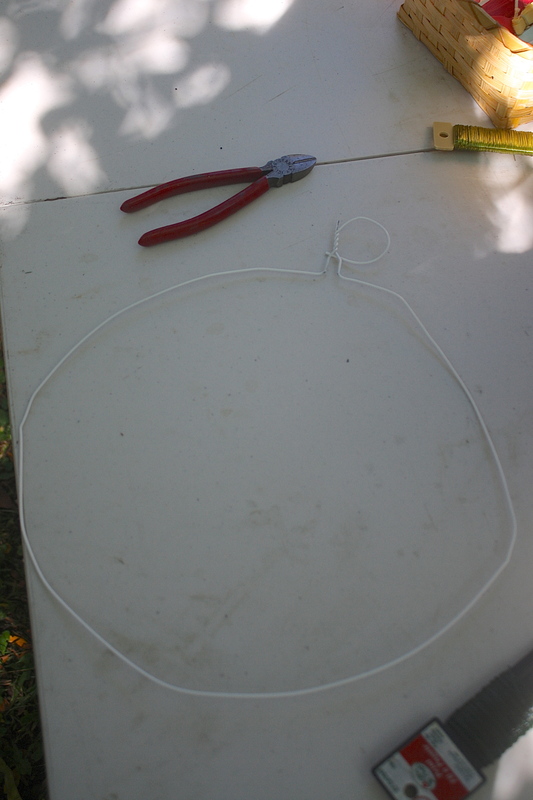 Advancing by wrapping wire several inches along frame, we then place the next blooms and repeat. The idea is to try to position blooms so that the best color faces outward and there is some symmetry in size and shape as we work along. At the end we can cut tips and adjust edges to create a pleasing look. Carol had some Cockscomb (Celosia cristata) on hand to add to hers, creating a nice effect. Any combination of dried flowers can be added when making a wreath, each is a unique creation and all that matters is that it pleases you! Setting the finished wreath flat, out of bright light for a day or two to dry sets the bloom, so nothing will dry in a droopy way. Once dry, hanging on a wall that has indirect light will help to preserve the color. We had a lot of fun visiting, being creative and making something beautiful to enjoy in our home during the winter months. Our wreaths will also serve to remind us of this lovely autumn day shared with a friend. 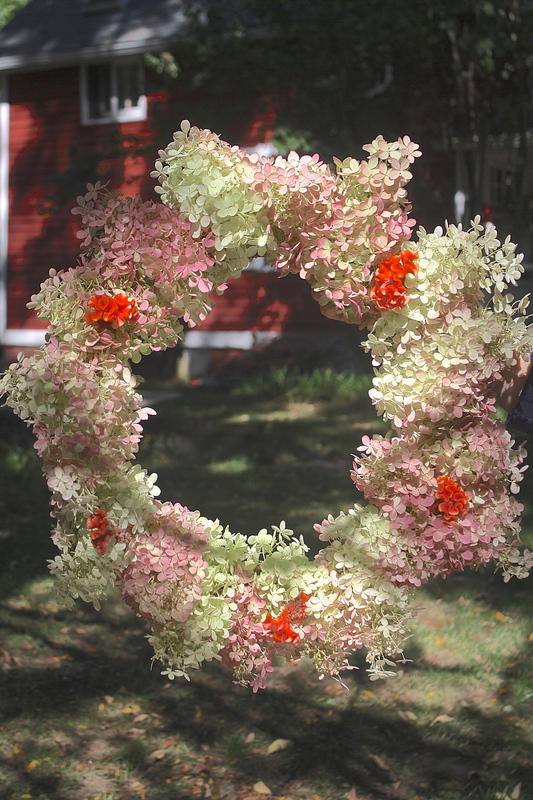 This entry was posted in Country Gardening, Country Living, My Photos and tagged autumn flowers, cockscomb celosia, creativity, dried floral arrangements, dried flowers, dried wreath making, flower bracts, PeeGee hydrangea. Bookmark the permalink. How incredibly sweet looking these wreaths are! Not just sweet, but quite beautiful too. To think that you made them yourself. And with a friend. A+ !!! Wow, I am really impressed. I assume you keep them indoors after they dry? Doesn’t the indoor air make them too dry? So, here’s a question for you Eliza. For one year I lived in Indiana with my grandparents. For my science project, I collected leaves from all the trees and identified them. In order to preserve them, my grandmother had me soak them in “glycerin water” (if I recall correctly) and then press them between paper. Have you ever heard of glycerin water to preserve plants? Once dried, the wreaths can last for years, but once the spring comes and the air here becomes humid again, they will absorb moisture, could get moldy and fade in color. I don’t have air conditioning, so I end up tossing my dried stuff every summer. Glycerin is used to preserve plants, keeping the color almost perfectly. I see it mostly in eucalyptus and those dyed orange oak leaves that they sell in the fall. Isn’t it great to have a friend sharing your crafty moments? I have a memory of using hair spray on Pampas grass heads (and other things too) to prevent seed heads from “dropping”. Oh, yes, that is a great technique for preventing the shedding of seeds. 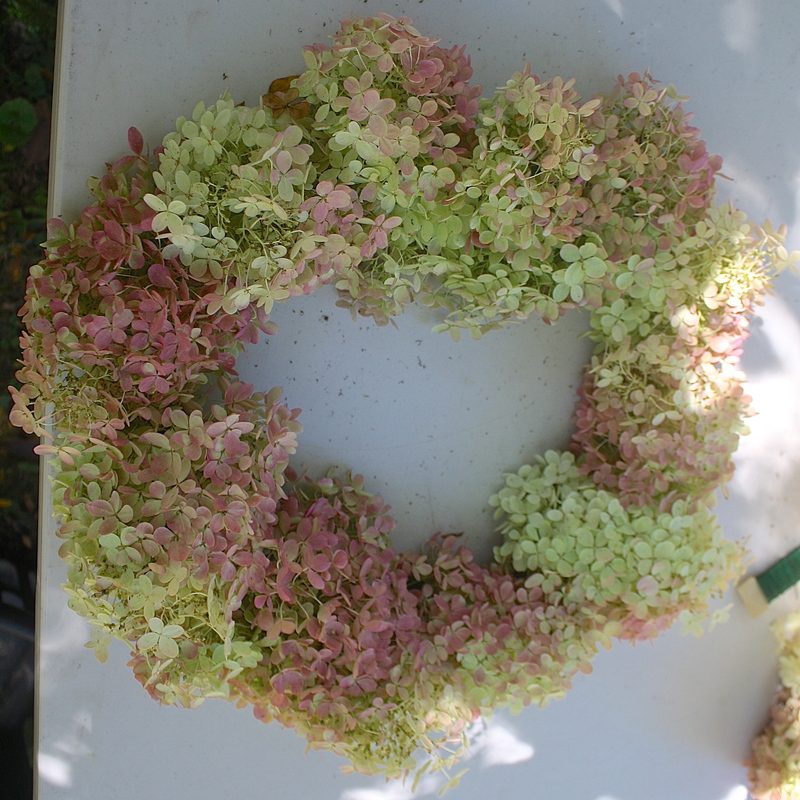 I remember a time when we gleaned hydrangea blossoms in a cemetery to make these wreaths many years ago! They were always beautiful. Great “how-to” article! Thank you, my dear. I like the word “gleaned” – sounds much more respectable! 😉 ‘Deadheading’ to improve next years production works, too! Thanks, Val. Try it out – super easy and quickly done! You can also just arrange them in a vase (with no water) to dry, and they’ll last all winter. Quick and easy! Eliza, how long will one of these beauties last in the house? Do you spray with anything to preserve or just let it be? I think this is just lovely!! Thanks for the tutorial. They need to be kept at low humidity because they will absorb moisture, then be susceptible to mold. I find they keep their color (if kept out of direct light) until about July when they fade to tan. Some people keep them for years like that. I’ve never sprayed preservative or hair spray on my dried stuff, so not sure how effective they are. A florist might know or try online. Let me know if you make something! Lovely demonstration, thanks for sharing this. You’re welcome, Maria. Perhaps you can make a wreath out of fresh tropical flowers, but if it is humid, it wouldn’t dry or last long, but it would be pretty for a day! How lovely, Eliza! And a wonderful feeling to spend a day outside with a friend, creating something beautiful and seasonal. Our neighbor has PeeGees — I have a Limelight. 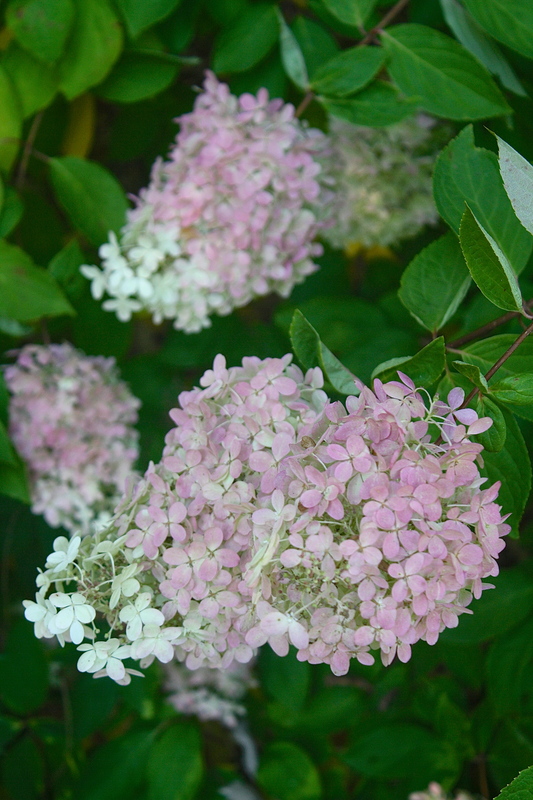 Even though they don’t produce berries, they’re wonderful shrubs and I look forward to them every year. Maybe next year I’ll give this a try. I have a lime Annabella, but it went by before I had a chance to dry some. They are really pretty and keep their color quite well. I usually just arrange a dry vase with them and that’s that. Super easy!